Chatapur rugs are made from hand spun viscose cellulose. This beautiful silk-like yarn gives a lustrous silk like appearance but at a fraction of the cost of silk. The natural characteristics of viscose and the quirkiness of the shimmering pile adds to the character and texture of the stunning handmade collection. 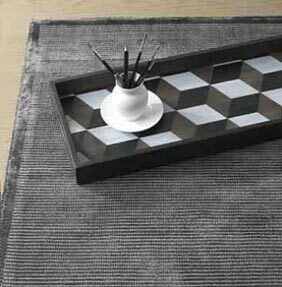 Chatapur rugs feature a narrow border around the edge, the centre features loop pile weaving, this gives a distressed antique look. Choose from four colours, Platinum, Zinc, Iron and Night. All colours are available in five sizes. Bespoke made to measure sizes are available to order.